A snowy day calls for oven baked chicken! Its really not that difficult to prepare, and the great thing about this meal is you have leftovers for a few days, including chicken salads for lunches! My kids love my garlic chicken! First thing is to remove chicken from overwrap and remove the giblings inside. Throughly clean the chicken inside and outside. Put it in a big bowl, cover with water and add enough salt to make the water a bit salty. This will give the chicken a better flavor, dont worry you will rinse the salt later. Cover and refridgerate for at least 2 hours, preferably longer. 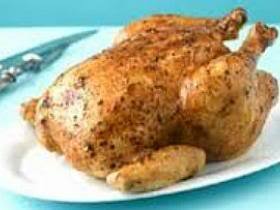 About 3 hours before you plan on eating, remove chicken from salt water and rinse thoroughly. Place the chicken, breast side up(!) on a glass baking dish. Cut the garlic cloves and inject into the breast meat or under the skin. I just slice a few sections on the breast and push the garlic inside, but if you have an injector it would probably be more convenient. Under the skin too, it will give it a yummy flavor. Coat the entire skin evenly with melted butter or olive oil (this makes it crispy for those who like to eat the skin, although its fatty!). Then sprinkle the seasoning on top, and paprika if you like color. Cover the chicken and dish with aluminum foil. Preheat oven to 350 degrees. Bake the chicken for roughly 1.5-2 hours or until you see the skin browning. Remove from the oven and baste the chicken by taking its own juices and spreading over the skin and inside on the meat. This is also about the time I add side veggies to the dish, such as cabbage, broccoli or onions. If you find there is too much juice and the veggies get soggy, just remove some of it, because the veggies will cook with the chicken’s steam. Let the veggies cook for roughly 30 minutes. Then remove them, and cook the chicken without the foil for another 30 to 45 minutes or until the meat is well done. Now while this chicken is cooking , you can add other sides. My family like potatoes, so sometimes I will wrap a few potatoes in aluminum foil (you can coat the potato skin with olive oil ), or sweet potatoes. Sometimes I will make a rosemary potato dish with cut up red potatoes, rosemary, fresh garlic and olive oil. The ideas are endless. You can also use the oven heat and cook fish on the bottom rack for those of you who like to prep your week’s meals on Sundays! IF youre following a healthy or fat loss lifestyle, that is probably the best thing you can get in the habit of doing!